| Chicago, IL - September 11, 2018 | Wolf-Gordon collaborated with designer and artist Brenda Houston on a collection of digital wallcoverings that expose the unique layers and colors of rocks and minerals. 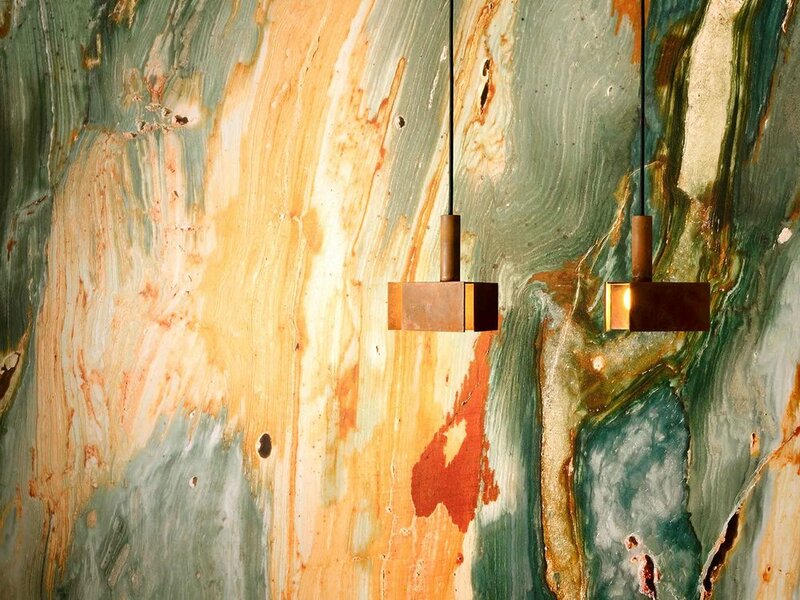 Houston, an expert on rare minerals who incorporates them into art and accessories of all kinds, created the wallcoverings by enlarging digital images of fossils, wood, and stone. The murals give unique impressions when viewed in different colorways and at various scales, bolstering Wolf-Gordon’s Curated Collection with a unique opportunity to explore nature and offer it in bespoke patterns. "I have been fortunate to work in the luxury sector my entire career, and am honored to collaborate with Wolf-Gordon. They instinctively understood the importance of producing a quality product and the amount of detail I wanted to achieve. Working in stone can be incredibly challenging, and I am grateful for Wolf Gordon's patience and support throughout the year long process." - Brenda Houston, Designer and Artist. Houston is an avid collector of gemstones, minerals, and fossils, a passion that has inspired her to travel the world in pursuit of exceptional specimens. The wallcoverings in her first collaboration with Wolf-Gordon showcase some of her most treasured pieces. The difficulty of creating a realistic interpretation of stone that has nuanced color and detail led her to the year-long development and perfection process that would allow her to fully capture the materials at a scale suitable for wallcovering. Chrysocolla II is a perfect slice of stone featuring swirls and eyes of malachite with the deep blues of azurite. The namesake mineral also has glimmering quartz crystal accents, and is presented in tones of green, blue, black, and white. Green Bog Jasper has stripes of petrified materials in shades of green, cream, orange, and brown. A snapshot in time, it captures the algae, fallen trees, vegetation and swamp animals that were in the bog where the wood was found just before it was covered in fallen ash. Onyx Mexicano is inspired by the pattern created when slicing its namesake stone vertically versus horizontally, revealing bands of calcite, iron, and various colors of onyx with a rugged look. It features natural colors of cream, white, ivory and yellow, and fractures not normally seen since vertical cuts are unusual. Stromatolite is an organic pattern featuring layers of color formed over millions of years. Based on one of the Earth’s oldest fossils, it is offered in deep red and pewter metallic colorways. American designer and artist Brenda Houston was an award winning visual director and luxury store designer prior to launching her company in 2008. Houston is acclaimed for her contemporary works using the very best in organic materials, specializing in agate, fossils, woods and minerals. Houston’s bespoke furniture and collections can be found in select showrooms worldwide and featured in Salon shows such as Art + Design, Nomad and TEFAF. Houston launched her textile collections in 2015 to showcase her private collection of minerals that she had gathered over her lifetime of mineral collecting.